Die young, or live long enough to see your heroes become That Guy. I used to like Steven Pinker, when I was a teenager first discovering a love of linguistics. He had awesome hair, and he wrote language books that I could actually find at my local bookshop. 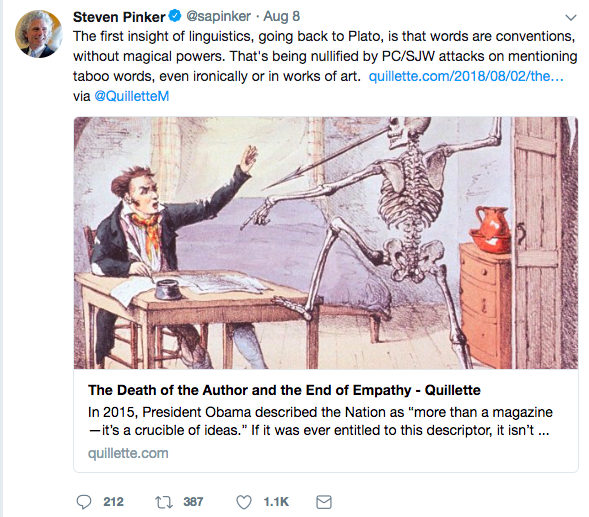 I can't say it was a major disappointment when the recent controversy blew up on Twitter; my adolescent admiration had long since been redirected to other targets, and Pinker was barely even a minor player in my adult linguistic pantheon. But it was frustrating to see yet another public intellectual double down on arguments that harm vulnerable people. The elaborate rituals around the ‘n-word’ evince the same double standard regarding authorial intention. According to existing conventions, whites may never use the full word without elision, even if they are doing so not to refer to anyone but as reported speech. Its mere presence in the mouth of a white person launches a nuclear bomb against blacks; the transgressor will be punished accordingly, as the founder of Papa John’s pizza discovered after using the full word as an embedded quote from chicken impresario Colonel Sanders. Blacks, however, can use the word in toto to refer to actual people, because their intentions matter and it is assumed that blacks are incapable of racist intent. Black Twitter users used the n-word 6.2 million times in one month, according to a 2015 study; it is ubiquitous in urban vernacular and in rap music, with black entertainers like Jay Z, Beyoncé, and Kanye West tossing it off with impunity. Heather MacDonald, The Death of the Author and the End of Empathy. Many, many replies to Pinker on Twitter have torn apart the hamfisted appeal to Plato in both MacDonald's article and his own tweet; I won't reiterate any of that argument. But I am intrigued by MacDonald's framing of this narrative about the n-word as being a tussle between white and black people. This term is strongly racially offensive when used by a white person in reference to a black person. In written Black English and written representations of spoken Black English, however, there are usually not the same negative connotations. Recently the term has been reclaimed by some black speakers and used with positive connotations in various senses. [...] However, even among black speakers, use of the word is problematic because of its potential to give offence. I'm not attributing this, because the point isn't to call out this particular publication - or any other. But it shows some interesting parallels with MacDonald's framing of the issue: note specifically that the word is called offensive "when used by a white person". This is evidently insufficient as an account of the sociology of the n-word. A Chinese-American, a Bangladeshi, or a Saudi Arabian would equally be offensive if they used it. So what's happening here? I think it's the confluence of two different forces. Firstly, in the Anglophone world centered around the UK and the US, it is undeniably white people who have been the worst instigators of racism against black people, so when the lexicographer imagines the n-word being used as a weapon, she imagines a white person using it. Secondly, however, there is also the issue that lexicography still lacks voices of colour contributing to may of the major dictionaries. The usage note here centers the white experience, eliding the existence of non-whites as everyday users of the English language. Unlike MacDonald, this dictionary is non-prescriptive. It attempts to describe the circumstances in which this word is considered offensive, and leaves it to the reader to decide whether she wishes to use it. But in focusing on the white/black duality, it fails to address readers of other ethnicities, fails to help them understand their own place in the power dynamics of the n-word. As you'll no doubt have noticed, I'm one of those who is absolutely unwilling to use the word, even when citing it as an object of study. This isn't because - as Pinker would have it - I believe that words have magical powers. It's because I know that words have the power to change our psychological state, for the better or the worse. When we hear things that have strong emotional associations for us, we can't always choose how we react. As a child in school, I was bullied. I was, shall we say, not of a prepossessing appearance, and I wore big glasses which, according to some boys in my class, made me look like a particular male kids' TV star. They would yell his name at me all day, in class, on the playground. Soon, kids from other classes and other years joined in. His name became mine. Other kids who didn't know me would call me by his name. Luckily, he faded from popularity, but he still comes back on the odd vintage television show or retrospective, and every time I hear his name, I'm reminded of the twelve-year-old girl who knew that she was ugly and unlikeable, and I feel that way all over again. I'm not telling you this for sympathy, but because I bet a lot of us can identify with the experience of having specific, apparently inoffensive words become the focus of bullying against us. Some of us shrug it off. Some of us are still affected by it. The important point is this: the comedian's name isn't aimed at me when he reappears on TV, just as the n-word is not being used insultingly at black people when cited by a linguist or other commentator. But that doesn't matter. If you've heard something in one context often enough, hearing it can be enough to evoke that context in a startlingly immediate way. And that isn't the fault of the black people who object to the word. It's the fault of the people who used that word over and over and over again as a term of abuse and denigration, often combining it with violence, so that it evokes danger and hatred whenever it's heard. And yes, those people have predominantly been white people - but that doesn't mean we're the only ones whose linguistic usage should be considered by lexicographers. So this is why we can't have not-so-nice things, like saying the n-word with impunity. This is why I believe that non-black people like me who want or need to discuss the n-word should never speak or write it in full. It's inconvenient, and it can make our writing and speech clunky, but why wouldn't we be willing to accept that in order to spare our potential audience a traumatic emotional reaction? If we're being selfish, we could even consider how the emotional reaction detracts from appreciation of the no-doubt earth-shatteringly important and elegant points we're making. We should want our audience to be focusing on our words, and sometimes the best way to ensure that is to avoid those words whose emotional freight is so heavy that we simply may not ask individual readers or listeners to bear it. Copyright © 2018 Bethan Tovey.